Cycling has its theatres and many are in remote and rural settings. This makes them enjoyable to ride as what can be a packed climb is deserted the rest of the year but this means the sport takes place far away from the people. Here is a climb that starts right out of one of Italy’s major cities. 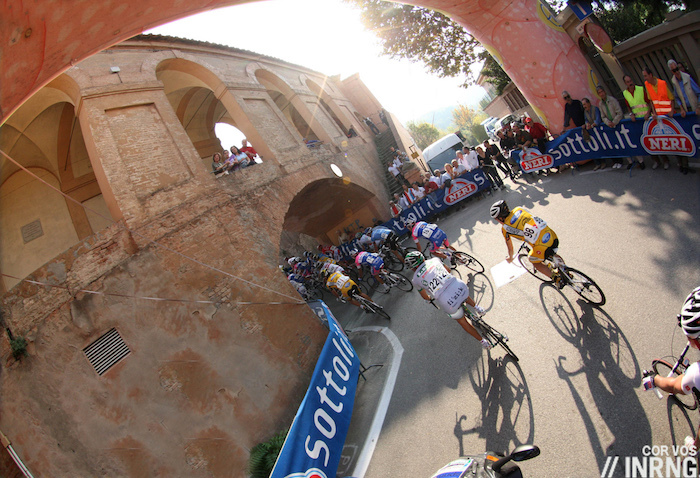 The Route: the Via San Luca starts in Bologna in the region of Emilia-Romagna in Italy. It is 1.8 km long and averages 10.8%. The Feel: it’s easy to find, the Via San Luca is famous for its arched walkway and the red brick portico starts well before the climb kicks up. The actual start of the climb is marked by an arch over the road. Unlike Alpe d’Huez, the Stelvio and even the Poggio this one features a junction regulated by traffic lights, a dull detail but a clue as to just how urban this climb is. Cycling is different from most other sports in that it doesn’t take place in a stadium and the start is a reminder. It’s steep at 14% and within seconds you gain enough altitude to peer over the rooftops and can see the city’s sports arena. There’s a small stadium feel to this climb too, the cyclist rides up the road while locals and tourists march up and down the Portico, an ever-present audience that you don’t usually get when climbing. Just don’t perform for the crowds, the climb is steep and stays steep and the gentler blue section on the profile above of 6.8% is flattered, and flattened alike, by a brief level section that’s too short for recovery. This flat section signals the hardest part is yet to come, the road levels out as the pedestrian walkway continues keeps climbing and you ride under the footbridge and then are suddenly confronted by a steep S-bend, the curva delle orfanelle or “orphan’s corner” which is chased by a long straight section. Here you can only see the road rising up at 16% and the sky above, there’s no view beyond the tarmac horizon. Eventually the road crosses the walkway and once the portico is back on your left the finish is near. The surface is good all the way up and the regularity of the arched portico walkway means you can count how many pedal revs it takes to pass an archway, invariably several since you’re in a low gear. This climb doesn’t have the celebrity status of the Mur de Huy but it’s as hard if not harder and rarely seen on TV. Finally the Basilica San Luca comes into sight and the road levels out. It’s under two kilometres long but the Strava record is six minutes and a lot of pros need eight minutes. It’s not unusual to see foreign tourists click-clack walking their way up. Once at the top there’s a fountain for the thirsty and benches for the tired. The road continues, this is not a hilltop chapel instead you ride on into the Apennines. The Basilica itself has little to do with cycling but bears the motto exibit salvatio de monte, to escape from the mountain. Fitting for an urban climb, no? The History: Daniel Friebe’s Mountain Higher recounts that it took 47 years to build the brick portico which includes an eerie 666 arches between the city and the basilica. It’s been used three times in the Giro, in 1956 they held an uphill time trial, in 1984 Moreno Argentin won a stage and in 2009 Simon Gerrans took the stage. The 2009 moment is interesting as much for the brief duel between Gerrans and a then unknown Anglo-Kenyan rider with the Barloworld team called Chris Froome. 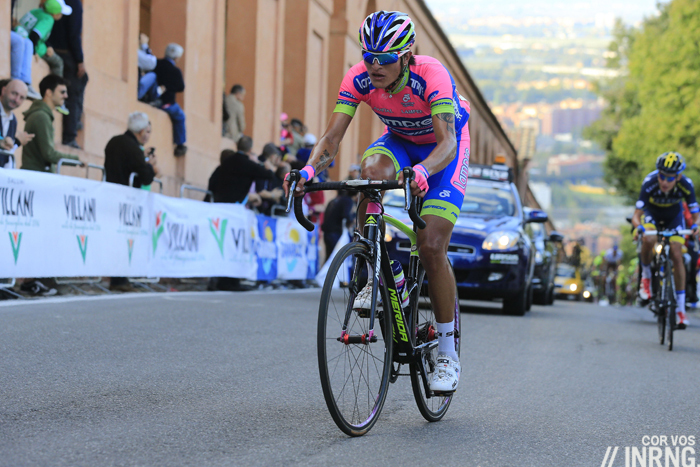 However the climb is more regularly associated with the Giro dell’Emilia, a race that goes back to 1909 and has more recently added a women’s race and both take place today. It’s unclear when the San Luca finish was added but now the race features a finishing circuit that includes a gruelling four climbs of the San Luca. The men’s race lacks some lustre and its history, scenery and challenging course ought to make it ideal for TV. Travel and Access: Bologna is a major city in Italy with its own international short-haul airport, plenty of road and high speed rail connections. Unfortunately the race doesn’t seem to be on TV in the UK, sounds like a good one. Tre Valle Varesine and Milano-Torino are on in the week so it’s odd this one isnt. Thank heavens, back to the actual cycling. Good to see you’re still getting out Inrng. To be honest I’d not heard of this climb before, didn’t see the 2009 Giro as I’d fell out of love with the sport a bit then, but going to seek that footage out. It looks a pretty spectacular finale for finish. After your captivating description, I was floored they climbed it 4 times. Sounds equally beautiful and grueling Thanks for the insight. Thanks! Lovely clip. Superb sporza commentary and a rogues gallery on GC. Perfect Sunday morning tonic. It seems a very bad idea to ride the wrong direction, against traffic. Good point! There are plenty of race routes (at least in Italy) that go the wrong-way on one-way streets so it’s tough to duplicate what the pros face without risking becoming a hood ornament on someone’s Fiat 500. This climb seems hardly worth the mention based on what’s here. 1.8 km at 10.8% average would seem to be stretch for inclusion in a book called Mountain Higher? Don’t worry, the no entry sign is accompanied by the wording “nei giorni festivi”, ie it’s no entry only when there’s an event on the climb, it’s open for the rest of the year. A massively under-rated area to visit. Great riding around here, particularly the Appenines, and lots of good cycling teams, clubs and organised gran fondos / sportives to get along to. The food in Bologna is great too. If you have been to all the “famous cycling spots” and are looking for something different, this area and Le Marche really do have great roads to ride. One of the big areas for cycling in Italy, the roads on a Sunday morning are packed with the locals and plenty of pro cyclists. Sometimes the roads in the region and Le Marche are a bit rough but you quickly get used to it. For sure! We liked the area so much we created an itinerary there, starting at Galleria Ferrari, up into the Lambrusco hills to Sestola and all through the Appennini, finishing at Dozza. Sadly, as you’ve noted, this unsung area is not popular with foreign cyclists and we were only able to run it for two years. As to “Do Not Enter” – we had to deviate from the MSR route a time or two because the route went the wrong-way on a few roads. Race day of course is great, but the other 364 days a year, you’d best not risk it. It truely is a special climb. I lived, rode and raced in Bologna for 15 years. The last 3 was just off Via Saragaozza near the base of the climb, but in full view of the church at the summit. However, from a roads to ride perspective, the backside of the climb, Via Casaglia is another fantastic climb. Rides routinely would finish with hill repeats on the Casaglia. And it’s not just those 2. The surrounding Colli have one climb after another with beauty views of the city. It’s a climb and venue that should get a proper placement in the world of cycling next to many iconic finishes. Your post has me longing for the days when all of these climbs were my daily training venue. I’ve also been a local rider for years and you deserve a massive +1 (even if repeats never were my thing ^__^). From Via di Casaglia I used to love the crazy hairpins of Via del Genio, then going down the wall of La Osservanza and more hairpins to S. Vittore, or via di Roncrio for the views (less trees). What’s really incredible is that in, say, Sabbiuno, or Ancognano, such are the surrondings that you’d never believe that you’re just ten kms away from a pretty big city. Important benefit, more or less zero traffic, if you choose the right roads. +1 Endless empty rural roads, right outside a very nice city. I’ve only done one ride in the area but away from the valley bottom highways all I saw was a handfull of mtn bikers. I’d go back for sure. Thanks for the description. 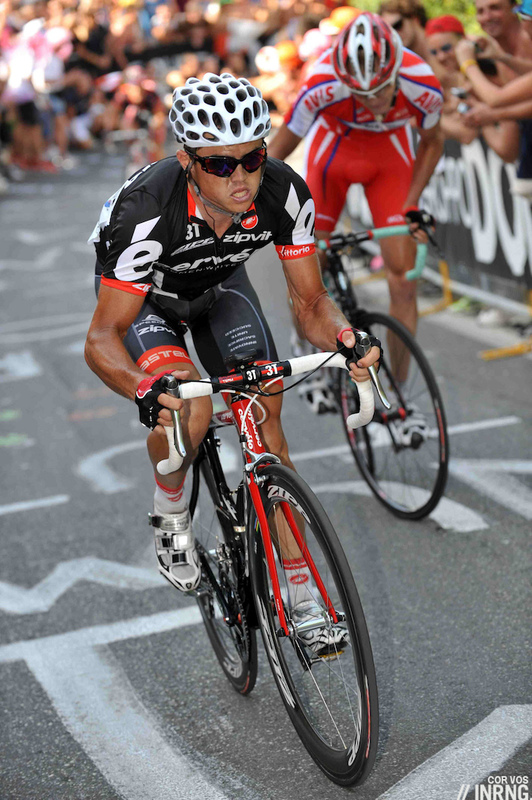 I was just yesterday in Italy and I had the opportunity to watch the Giro dell’Emilia on Rai Sport. I was really impressed by the climb when I saw it on TV and first wondered what the hell was the building it followed all the way long (untill it was explained by Stefano Garzelli and his acolyte…). Beautiful fight Chaves against Aru by the way. Italy is really packed with enjoyable roads to ride, even if sometimes the asphalt could be better. The pavement used to be pretty good everywhere (except Lazio) until the financial crisis wiped out the budget for upkeep and repair. I’d love to be an asphalt plant owner when they finally have money again to fix the crumbling roads! Quite incidentally: what is the main culprit in causing the crumbling of the roads and the deterioration of roads? I mean, here it is (a) ground frost, i.e. the process of the ground *and the water* in the ground under the asphalt freezing and thawing, often repeatedly, especially in combination with heavy vehicles, and (b) the studded winter tires (of motor vehicles) scraping the asphalt surface (bared by natural or salt induced melting of the snow and ice and the ploughing of the roads). I’d imagine they get a fair amount of frost in Emilia-Romagna. The freeze thaw cycle you refer to will be worse than somewhere further north, like say Germany, because rather than staying below freezing all day it’ll warm up enough in the day so that the cycle happens on a daily basis, rather than just in the occasional thaw or in spring. And then when it rains those cracks will get washed out. In Northern England we get a lot of frost and even more rain, so you can imagine how bad the roads are here! Thanks for the elucidating replies! My question obviously revealed that apart from visits to the big cities I haven’t traveled much in Continental Europe! But it should be perhaps pointed out that the freezing and thawing is not just a seasonal phenomenon up in the north, either. It is also a daily process in the spring when the nights with clear sky can be quite cold and the sun can really warm up the black asphalt during the day. If you add to that the motorists have a funnyt habit of postponing the switch from studded winter tires to summer tires to the last date before which they can get fined by the police (and that date is set by the condtions in the north of the country) ou can imagine the rate of wear. Does anyone else remember this climb from John Grisham’s The Broker?